That's it for today's live commentary. Thanks as ever for your company and interaction. Andrew Benson's FP2 report is now on the site and can be read here. We'll also have an update on the track invader and any other juicy lines we can lay our hands on. We'll be back with you tomorrow morning from 04:30 BST for third practice and qualifying. We'll be bringing an end to this broadcast shortly, but before we go, here's some of your F1/marriage puns. "It was better than Malaysia - I got to do the whole session so I'm happy," Hamilton told BBC Radio 5 live's Jennie Gow. "Generally the car was feeling good and it was nice to get the running and the preparations. Hopefully that will stand me in good stead. "The Ferraris look like they were as quick as they were in Malaysia. But hopefully we're quicker." We asked you to vote on the most surprising of all the surprise race winners over the years - but is it a surprise who came up trumps? Jenson Button was your pick, taking 37.8% of the vote for his amazing win at the Canadian GP in 2011. Olivier Panis was second and Pastor Maldonado third. So, it's as you might expect at the very top of the order with Lewis Hamilton fastest overall at the end of today's practice sessions. His best time, set on the soft tyre, was a 1:37.219 - around four tenths faster than the Ferrari of Kimi Raikkonen. Red Bull's Daniel Ricciardo takes third, a second down on Hamilton, with the second Ferrari of Sebastian Vettel in fourth. Nico Rosberg is 1.2secs down on team-mate Hamilton, although he did not seem to get a clean lap on the softer - and quicker - Pirelli tyre. Bit of needle on track there between the Ferrari of Kimi Raikkonen and Mercedes's Nico Rosberg. The two were side by side through the first corner and then continued to battle through the next few turns before Rosberg got ahead. Save something for Sunday lads. Just on that bride and groom entry of a few moments ago. 'In sixth gear and in health'. Hmmmm, we're not sure. Daniil Kvyat just had an odd moment. With some flames and smoke coming from his left-rear brake, he was on a slow lap back to the pits but still carrying enough speed to run off track at the end of the long back straight. The Red Bull bounced through a gravel trap and was almost at a stop when it kissed the crash barrier. A soft impact but enough to remove the front wing. F1 on Twitter: IN SIXTH GEAR AND IN HEALTH: Further proof that #F1 fans are the best fans! Daniel Ricciardo, having spent much of FP2 in the garage due what Red Bull called "set-up tweaks", has gone third quickest on a 1:38.311. Your top three with just under half an hour remaining is: Hamilton, Raikkonen, Ricciardo. We've been asking all morning for your choices for F1's surprise race winners. We've tried to give you a taste of some of the standout candidates but it's far from an exhaustive list. Even so, we've knuckled down to give you a list of eight race winners to choose from in a vote to find the most surprising winner. We've gone for: Peter Gethin (1971 Italian GP), Vittorio Brambilla (1975 Austrian GP), Gilles Villeneuve (1981 Spanish GP), Olivier Panis (1996 Monaco GP), Johnny Herbert (1999 European GP), Sebastian Vettel (2008 Italian GP), Jenson Button (2011 Canadian GP), Pastor Maldonado (2012 Spanish GP). Apologies if your favourite is not listed. Harry Harribo Repton: What about Johnny Herbert and Stewart GPS first win at the nurburgring in 99! Steve Lank: For me it has to be Olivier Panis at Monaco in 1996 in a Ligier. What a legend! Moments before Felipe Massa's accident the Mercedes of Lewis Hamilton had clawed its way back to the top of the timesheets. On the soft tyre, the reigning champion posted a 1:37.219 - four tenths quicker than Ferrari's Kimi Raikkonen, who also set his time on the soft. The Williams has been cleared away and we're off again. Felipe Massa is having a trying day in the Williams. The Brazilian, who span in FP1, lost his car under braking for the hairpin at turn 14 and skewed left into the barriers, his tyres squealing in protest as he went. The front wing of his car was taken off and he's off back to the paddock on the back of a scooter. Kimi Raikkonen has been out on a set of the soft Pirelli tyre and set the quickest time of the day by some margin. The Ferrari has posted a 1:37.662 - 1.4s faster than Hamilton's previous best, posted on the harder tyre. Hamilton and Mercedes team-mate Nico Rosberg have gone out on the soft so a response should not be long in coming. Peter Gethin never completed a full season in F1 yet his is a name familiar to F1 fans the world over. After earning a single championship point in his debut year with McLaren in 1970, Gethin arrived at the 1971 Italian Grand Prix at Monza with a best finish of eighth place under his belt that year. A win was not on the cards, especially after the Briton qualified in 11th, 1.48secs behind Chris Amon's Matra. After a race of high attrition, the battle for victory came down to five men - Ronnie Peterson, Francois Cevert, Mike Hailwood, Howden Ganley and Gethin. In a mad last-lap scramble, Gethin vaulted from fourth to first to take the chequered flag by 0.1secs from Peterson - the closest finish in F1 history. Just to fill you in on a replay we saw a little while ago, a man dressed in rather anonymous attire was seen to run across the track from the main grandstand to the pit wall. He got across the track just a few hundred yards ahead of a Force India and leapt over the pit wall. We've not heard the last of this. Suspect the FIA will have something to say at the very least. Nico Rosberg was half a second behind Lewis Hamilton in FP1 - an age in this here sport - but he's already got that gap down in FP2. The German's 1:39.126 is a big improvement on his morning. He trails Hamilton by 0.068secs. Everyone has gone out in this session bar the two Red Bulls of Daniel Ricciardo and Daniil Kvyat. McLaren on Twitter: Splash of neon in the garage earlier as the team spray flow-vis on Fernando's car. We've had a handful of cars pointing the wrong way today and Sebastian Vettel's Ferrari has just become the latest, the German doing a full 360, just catching the gravel, on the exit of turn three. He carried on and radioed back to say the car was in good nick. Just overdoing it. This was a great story. The 1996 Monaco Grand Prix is rightly remembered as one of the best races of all time. A huge number of retirements, incidents and surprises, at the end of which Ligier's Olivier Panis had come from 14th on the grid to win. A wet and wild race began with reigning world champion Michael Schumacher sliding into the barriers on lap one and did not look back from there - with just 11 cars running on lap 31 of a scheduled 78. Damon Hill led and retired, as did Jean Alesi on lap 60, handing a lead to Panis that he would not relinquish. But that was not the end of it. Jacques Villeneuve collided with backmarker Luca Badoer to reduce the field further, and when Eddie Irvine's unwise spin-turn on a blind corner took out Mika Salo and Mika Hakkinen, just four cars were running. That became three when Heinz-Harald Frentzen peeled off on the penultimate lap, leaving Panis, David Coulthard and Johnny Herbert the only men running at the chequered flag. I've been sat on this picture of Romain Grosjean since around 2am UK time and only now do I feel ready to share it. It's... intense. Apparently it shows his jet lag. Anyhoo, it's pertinent because he's actually in the car in FP2, having given up his seat to Britain's Jolyon Palmer in opening practice. Second free practice is under way. Manor Marussia's Roberto Mehri is your first man on track. McLaren on Twitter: Paella with the press. Fernando Alonso and Eric Boullier spotted sharing tapas with the Spanish media. 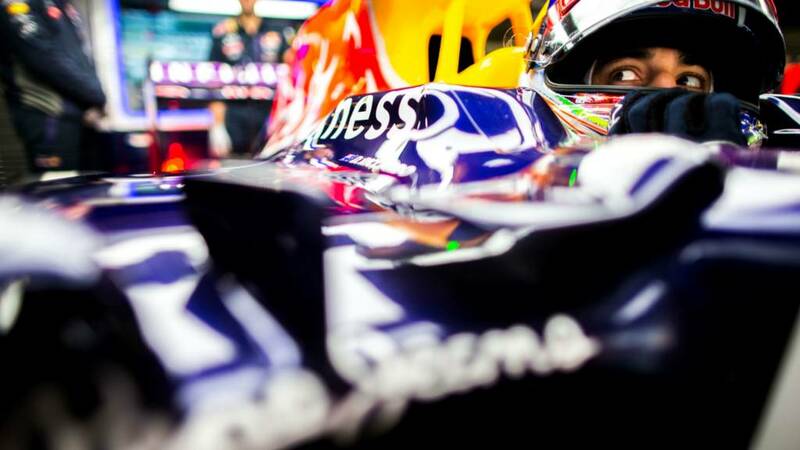 "For Red Bull, it has been a sobering start to the season. The controversy over Renault's lack of performance drew attention away from the team's struggles with their car in Melbourne, to the extent that when team boss Christian Horner, in the midst of his diatribe about the quality of Renault's engines, gave a very unconvincing answer to a question about why the Toro Rossos were so close to their big-budget works team, he was allowed to get away with it without a follow-up. "Malaysia, though, brought home some uncomfortable truths - Toro Rosso flat beat the senior team there. Daniil Kvyat, promoted to Red Bull from Toro Rosso for this season said this 'opened our eyes a little bit'. And it is now clear that the RB11 is far from the greatest Red Bull the team have ever produced. "Among the changes for this weekend are a reversion to a different brand of brakes from the one experimented with in Malaysia. Kvyat's team-mate Daniel Ricciardo said: 'Obviously we're experimenting with a few things but for now we're going to go back to what we know, to get the basics right. So we've reverted back on quite a few things and even to stuff from last year, which we knew was more efficient. It's obviously older, but it doesn't mean it's not better.'" "There were further signs of significant progress from McLaren in first practice. Fernando Alonso was seventh fastest after the first runs. He did not improve after that, but Jenson Button did, leapfrogging ahead of the Spaniard and ending up 13th. "McLaren gained what Button estimated to be 1.5secs on Mercedes between Australia and Malaysia and, while not expecting that progress again, expect to make another significant step in China. "Will they be able to mix it in the lower midfield, thanks to Honda learning on the engine - the team's biggest handicap - and further aerodynamic upgrades this weekend?" Vittorio Brambilla would finish in the points just nine times in a seven-year F1 career, with only one of those finishes on the podium. The top step to be precise. After picking up just one championship point in his first F1 season, burly Italian Brambilla retired from eight of the first 11 races of 1975 before improbably winning the 12th - the rain-hit Austrian GP at the Osterreichring. Having qualified his March in eighth, Brambilla made a flying start to run third early on before passing future world champions Niki Lauda and James Hunt to lead. With the rain intensifying, race officials called a halt to the race after 29 of 54 laps. Brambilla famously crashed into the barriers within moments of taking the chequered flag, but his place in the history books was assured. We've been asking for your picks for F1's surprise winners. We've had loads of great suggestions and we'll be recapping some of them as we amble through the next couple of hours. "Mercedes were in a different league in the first practice session, and this second 90 minutes should give a good indication of whether that advantage is real or whether Ferrari are in the ballpark again. "It was the race-simulation runs in the second half of P2 in Malaysia that first indicated how strong Ferrari were looking there - as Ferrari technical director James Allison said in Sepang, 'those Friday runs tend not to lie'. "So after the headline lap times are set on the soft tyre, the 'race sims' will make interesting reading." Ready for some more of the motor cars? Me too. Thirty minutes til they're back on track. Right, that's us done for the time being. You can read Andrew Benson's FP1 report here. We'll be back at 06:30 BST for the build up to second practice, which gets under way at 07:00. In the meantime, keep your surprise winners coming in. We'll recap some of your suggestions when we're back with you. Daniel Riley: Gilles Villeneuve '81 Spanish GP, with four cars on the tail of his 'Cadillac' Ferrari? Graham Wilson: Pastor Maldonado, Barcelona 2012. kept it on track for the entire race. shocker. Ariel Hernandez: Vettel in Monza 08. He's won so many races afterwards that one tends to forget how much of a shock that Toro Rosso win was. Williams driver Felipe Massa: "Engine was not good on the timed lap." Massa finished that session in 10th place, just one-thousandth of a second behind team-mate Valtteri Bottas but a full two seconds off Lewis Hamilton. FP1 timings - Lewis Hamilton in another sphere! Tip of the hat to Jolyon Palmer, who completed 25 laps in that session and finished just six tenths off the pace of regular Lotus driver Pastor Maldonado. Ok, that's clearly first blood to Mercedes after the opening 90 minutes of the Chinese Grand Prix weekend. A late, late lap from Sebastian Vettel made a mockery of my 04:30 entry, although the Ferrari man is still a fairly whopping 1.1secs off the pace of Lewis Hamilton. Nico Rosberg is second, half a second down on his team-mate. I don't want to alarm anyone, but Lewis Hamilton is currently one and a half seconds clear of the nearest non-Mercedes runner. Team-mate Nico Rosberg is a second clear of Sebastian Vettel in third. Do the Silver Arrows have a point to to prove? Zigzag: John Watson, Long Beach GP 1983 from 22nd on the grid! Felipe Massa has clearly been wondering what's so interesting about the run-off areas of this track so decided to take a look for himself - adding a neat pirouette into the bargain. "The two Manor Marussias have completed nearly 30 laps between them, which is certainly a step in the right direction." Lewis Hamilton is the latest driver to explore the limits of the circuit, his Mercedes getting loose through turn one and running wide. The Briton remains quickest with just under 10 minutes of this session to go. So... returning to Jonathan Palmer (I said he was interesting). After ending his racing career with Tyrrell at the end of 1989, a spell as a test driver with McLaren followed before he had a season in British Touring Cars in 1991. Around this time he became the BBC's pit lane reporter, graduating to the role of co-commentator alongside Murray Walker following James Hunt's untimely death in 1993. After those scoundrels at ITV nabbed the UK F1 TV rights at the end of 1996, Palmer focused on his business interests, including the formation of the Formula Palmer Audi Championship for young drivers (his son would take this route) and MotorSport Vision, which owns several tracks including Brands Hatch. "Jenson Button has been struggling with a bad back - he's had to miss some of his marathon training." Charles Ndlovu: Alonso 2008 Singapore win from p15. We're coming up on an hour gone and it's all as you'd expect at the top. Mercedes's Lewis Hamilton leading by half a second from team-mate Nico Rosberg, with Kimi Raikkonen's Ferrari in third. All 20 drivers have set a time. "Sebastian Vettel was coy on Ferrari's chances of beating Mercedes again this weekend, but team-mate Kimi Raikkonen, who has had bad luck affect his hopes in both races so far, was more optimistic. "Raikkonen said that Mercedes only looked so quick in Melbourne because he and Vettel had been stuck behind slower traffic early in the race. 'I said after Australia that if we would have been behind them in the race then I don't see that they would pull away, at least not as far as people think,' he said." A little more background for you now on Lotus new boy Jolyon Palmer, whose old man (above) is an interesting character. A qualified doctor, Jonathan Palmer combined his racing interests with his medical career before focusing on the track, enjoying his first taste of success in Formula Ford in the late 1970s. He won the 1981 British Formula Three Championship and the 1983 European Formula Two title. After testing for Williams in 1982, he made his F1 debut for the team at the 1983 European GP at Brands Hatch. He went on to drive for RAM, Zakspeed and Tyrrell but never really lived up to his early promise, with fourth place at the 1987 Australian GP his best result. Mercedes on Twitter: A little research into alternative lines - or, indeed, circuits - from Nico Rosberg at Turn 6 on that lap. He rejoins unscathed! Jolyon Palmer is in good company at very least, because many of his more illustrious peers are having a few lurid moments. Several drivers have missed their braking points as they probe the limits of the track, with 2012 Shanghai winner Nico Rosberg the latest to do so, locking up and running wide into turn six. It's fair to say Sebastian Vettel's win in Malaysia last time out surprised a lot of people, with Mercedes having been widely expected to win in a straight fight. We want you to tell us your most memorable surprise winners in F1. Simple as that. "That's where Pastor Maldonado went off last year whilst adjusting the switches on his steering wheel." And here's the video of that mad moment. Lotus on Twitter: Very thorough drive from Jolyon. We can confirm 'practicing doughnuts' is on the work sheet. Jolyon Palmer is testing the limits of the Lotus and has had a small moment on the exit of turn eight, the Briton pushing too hard and spinning off the black stuff. He quickly gathers it up and is back on his way. Toro Rosso on Twitter: Moooooorning!!! Helmets waiting... Just need our drivers now. #FP1 about to start here in Shanghai! Who's watching!? Nico Rosberg sets the first time of the weekend, a 1:41.052 the early marker in a Mercedes that has been liberally showering the circuit in sparks from its titanium skid plate in these first few laps. Replay gold for the TV director. Will weather swing advantage back to Merc? We're expecting a largely dry few days in Shanghai although there is the chance of a bit of rain later on Sunday. Forecasters currently expect all the track sessions to remain dry, with any showers most likely arriving after the race. Crucially there will be much lower ambient and track temperatures compared with Sepang last time out. We're expecting figures around 16-20C, with track temps in the mid 30s C.
Watch the weekend forecast here. "Mercedes driver Lewis Hamilton seems pretty convinced he could have won in Malaysia had things not worked out the way they did. "The world champion felt that he had he not missed much of Friday practice with an engine problem, he might have learned enough about tyre usage and set-up for Mercedes to have approached the race differently. And he is holding to his view that even in the circumstances they had, stopping under the safety car was a mistake, because it lost him the best part of 10 seconds to Sebastian Vettel that he never really got back. "He admitted, though, that 'it was true pace Ferrari had. We'll get a better understanding here. We are not stressed and I think we will be stronger this weekend.'" First practice for the Chinese Grand Prix is under way. There's a new Brit on the block this weekend with Jolyon Palmer in the cockpit of the Lotus for first practice. Palmer, 24, won last season's GP2 title to become the first Briton to do since Lewis Hamilton in 2006. He is the son of former F1 driver and BBC commentator Jonathan Palmer, who made 82 grand prix starts between 1983 and 1989. "The Chinese Grand Prix could be a seminal race in this 2015 Formula 1 season. "After Mercedes crushed the field in the opener in Australia, Sebastian Vettel's victory in Malaysia two weeks ago came as a huge surprise. "But was it a unique combination of circumstances that played into Ferrari's hands, or will they be able to challenge Mercedes all season? "The much cooler conditions of Shanghai could provide something of an answer." Twelve months ago Mercedes enjoyed a one-two finish at the Chinese Grand Prix, with pole-sitter Lewis Hamilton winning ahead of Nico Rosberg, with Ferrari's Fernando Alonso third. The two Mercedes drivers can expect to be on the podium again this weekend - and can expect a Ferrari to once again be snapping at their heels after Sebastian Vettel showed the Scuderia's pace with a fine win in Sepang last time out. It should be fascinating to see how the Mercedes-Ferrari battle unfolds over the next few days. There's a whole lotta sport going on this weekend, with major events in the world of golf, football, rowing and horse racing. But, as you're reading this, I suspect for many of you the main draw will be events in Shanghai. Good morning and welcome along to our live text commentary of first practice ahead of the Chinese Grand Prix.